Tacrolimus is a medication given to patients who underwent organ transplantation. This drug needs to be taken according to the orders of the physician because increased serum level of tacrolimus may cause overdose symptoms [1, 2]. The drug Tacrolimus is under the immunosuppressant drug class. It functions by suppressing the activity of the immune system to prevent it from attacking the transplanted organ and prevent organ rejection of the body. This is prescribed to patients who underwent heart, kidney or liver transplants. The intended effect of this drug produces makes an individual at increased risk for acquiring an infection [1, 2]. Some of the side effects may include hypersensitivity reactions, fever, body aches, changes in mental state and problems with speech and blurring of vision. They may even develop tremors or seizures after taking the medication . The recommended dosage of Tacrolimus is dependent on several factors such as the type of transplantation that has been done and any medications that the patient may have been taking. The normal tacrolimus serum level is between 5-15ng/ml. There are studies that look into the amount of Tacrolimus taken before a patient manifest symptoms of overdose. An acute ingestion of about the 30 times the prescribed level of Tacrolimus caused a woman to overdose . Diagnosis of an overdose in Tacrolimus involves a review of the medical history, physical examination and laboratory test. The medical history will reveal a reason for the prescription of the medication such as a previous organ transplantation. The physical examination involves assessment for other signs and symptoms that may have presented. A serum Tacrolimus level laboratory test will be the confirmatory test to establish the diagnosis [1, 2, 3, 4]. A patient who have overdosed to tacrolimus should be brought to the hospital immediately. The initial priority is to assess the patient’s airway, breathing and circulation. Oxygen support may be provided depending on the need of the patient. An intravenous line needs to be established as well for the administration of fluids and medications . Gastric lavage may be performed if the oral ingestion of Tacrolimus occurred less than an hour before the patient is brought to the hospital. The properties of this medication make hemodialysis ineffective in reducing its amount in the system . The vitals of the patient will be monitored throughout the duration of the therapy. This includes the blood pressure, electrolyte levels and renal function. Medications like antihypertensive drugs will be given depending on the symptoms the patient have manifested . Taking tacrolimus is beneficial but it should be taken according to the physician’s prescription. If you have more information about this, you can post your thoughts in the comment section below. You can also share this article in your Facebook and Twitter to help spread information about the dangers of the overdose in Tacrolimus. Mrvos, R., Hodgman, M., & Krenzelok, E. (1997). 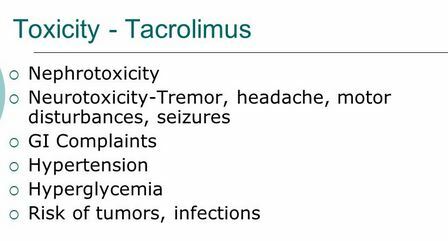 Tacrolimus (FK 506) overdose: a report of five cases. Journal of toxicology. Clinical Toxicology, 395-399.